Whether your notebook is a few years old or brand-new, hardware upgrades and software tweaks can add functions or enhance its capabilities. Here are 15 tricks to give your laptop superpowers. For instance, the Windows tool Camspace is pitched at gamers, but you can configure it for any application. It identifies objects in the Webcam's video feed and uses your movements to control the mouse and keyboard.Eyetwig, a Windows and Mac OS X utility, translates head movements into mouse control, letting you point and click without touching anything. Beyond that, a tool such as PC Updater can track down all of the files you need. This utility retrieves both driver and application updates directly from the manufacturers, so you can be sure that your laptop will run with the fullest range of abilities. RAM provides the foundation for your laptop to juggle multiple windows and applications. Since it’s possible to add more RAM than is useful--and since pursuing the very best performance eats into your laptop's battery life--using faster, low-latency RAM can eke out better results than just throwing in the absolute maximum amount. Performance gains can be minimal, and this upgrade is mostly for the fanatical anyway; you might get a few more frames per second in games or other high-end tasks. Most RAM resellers let you shop based on your laptop’s make; but if you’re unsure, a utility such as Crucial’s RAM scanner can identify what you need. With that information, buy compatible RAM with the lowest latency (CL) as possible. The rating references the time the memory takes to output requested data, often measured in clock cycles. A lower number means a shorter time. Solid-state drives trump standard hard disks in many ways. For one thing, they’re lighter. Since they have no moving parts--they store data in flash memory--they’re faster and more reliable. And an SSD merely sips from your laptop’s battery because it lacks those motors. You’ll pay more for these features, and you'll likely end up with a smaller disk after the SSD transplant, but these drives beat spinning platters in nearly every way. Many laptops ship with a small, sad hard drive. A 60GB drive is insulting, and even a 120GB drive can be cramped for anyone who wants to store lots of music and video. Break through those barriers by swapping in a massive replacement. A 2.5-inch, 500GB SATA laptop drive costs about $80, leaving ample room for files and for the OS’s virtual memory. You could even split the drive into multiple partitions for organization, or for an alternative OS. Check your laptop's manual or consult its manufacturer to learn more about the upgrade process. In most instances you’ll be able to open a door on the back of the laptop or remove the keyboard to swap in the new hard drive. In addition, be sure to pick up a SATA USB transfer cable, such as one from NewerTech, to move your old data to the new drive. A new CPU or graphics processor could add some oomph to an aging notebook. As a result of such an upgrade, your laptop could be faster than a new PC--but be aware that this procedure comes with caveats as big as the potential performance gain. Installing either part can be difficult, usually requiring a full teardown of your notebook. And even if your laptop supports an upgrade, getting the right parts can be hard. But if you’re adventuresome, check out our pictorial guides to wringing more life out of your laptop by replacing the CPU or upgrading the graphics card. If you carry a Swiss army knife or a similar multi-tool device, you probably don't take advantage of every file, knife, and toothpick on a daily basis; instead, you carry that arsenal for the unexpected moment when you might need one of those tools. Your laptop’s selection of ports is a similar concept: A wide range of connections is the centerpiece of a versatile, leading-edge system. To your notebook, you can add any missing connection, such as gigabit ethernet, Bluetooth 2.1, eSATA, 802.11n Wi-Fi, or USB 3.0. Your best bet for doing so is to use an ExpressCard slot, since it’ll be fast enough to make the most of the upgrade. For some upgrades, such as Wi-Fi and Bluetooth, you might be able to swap an internal module into the laptop; contact your PC's manufacturer to see if that works for your model. For upgrades that run at slower speeds, including Bluetooth, you could instead plug an external adapter into a USB port. 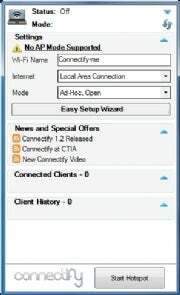 Belkin, Linksys, and other companies make various connection options. Need to attach your laptop or netbook to an external display? What about multiple displays? If you don’t have a built-in port, or if you want to attach more screens, use a USB adapter. NewerTech makes one that's a good option because of its high-resolution support. Since the adapter connects over USB 2.0, the performance is capped (don’t expect to run 3D applications or games). But for nearly any day-to-day task, the alchemy works well, giving you an additional display--or up to six displays, if you keep adding more adapters. Care for a laptop's battery, and it can last for several years. But if you want to upgrade for longer life, or if yours just isn’t holding enough charge, a third-party battery can give you more juice. Wherever you purchase the battery, be sure to buy a new one. Since batteries deteriorate over time and through use, an old or refurbished battery won’t work as well. Shop at a site such as Laptops for Less or Level 8 Technology. Find a battery that’s compatible with your notebook, and compare its ratings with those of the original; look for a higher mAh (milliampere-hour) or Wh (watt-hour) rating than the original for extended life.